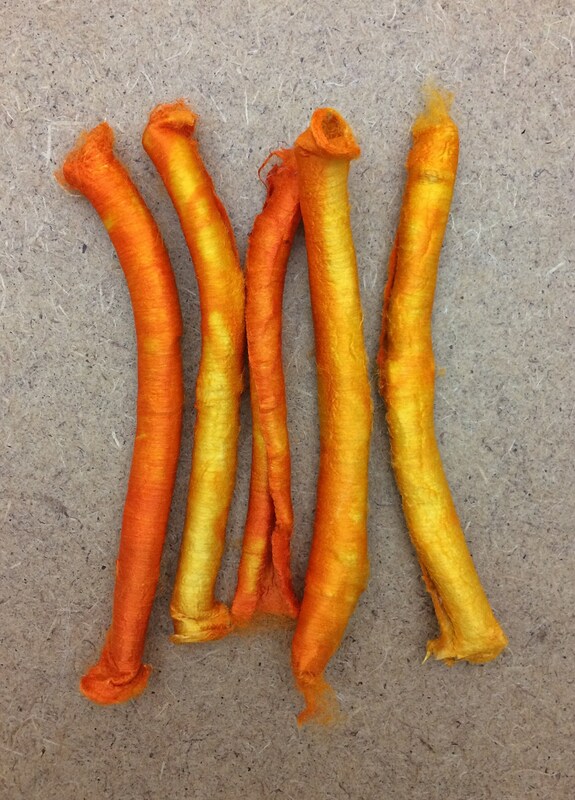 SILK CARRIER RODS - These slit tubes are the by-product of reeling silk from the cocoon. Rods are approximately 5 - 6" (13–15cm) long. They are wonderfully textural for stitching, silk papermaking and any embellishments. They can be pressed flat or pulled apart to reveal the interesting criss-cross of the fibres. Also used for felting, weaving, embroidery or mixed media. They contain serecin - if sprayed with water, criss crossed over each other and ironed they stick together to form interesting "silk papers". The listing is for 5 carrier rods in Daffodil Yellow.